First I would like to thank all of you for all the kind (and funny) comments you have left for me. 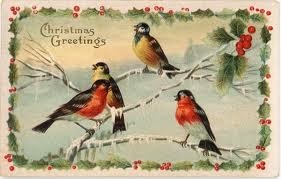 I truly love to share and wish that I could send each and every one of you a Christmas present. As most of you know, I am one person running this business and I am swamped all the time. I don't get to look at other blogs...maybe some day I will....but please don't be mad that I can't get to your blogs. I do hope to slow down a bit next year and then....just maybe....I can relax and go visiting blogs! Lets give away some trims! Do you do your own finishing? Use chenille trim or ric rac? Cluny ric rac is wonderful. It has a nice feel to it, looks fantastic and is easy to sew in place. Don't use trims? How about some hand dyed buttons....or sewing charms? I will show pictures on the day you get to choose. Lets give some trim or buttons and charm packs to three followers. Your choice. Rules: You must be a follower and post a comment here. Post on your blog and get 25 more entries. Drawing to be December 17th. What a challenge to keep track of all these give-aways....and what fun! Ho! Ho! Ho! Oh how lovely...you know how much I love your trims rofl. I won't enter this one; I won last year but good luck to everyone who takes part!! Your trims always look so pretty so please enter me in the draw. Thank you for thinking of your bloggers, I am a follower and enjoy it a great deal. Good grief, woman! Don't give away everything you have!!! :) Count me in. Thank you. Something tells me you are hoarding some of Santa's elves around your house to help out with all you do! :) Thank you for the chance to enter! Yes, I have been wondering about the challenge of keeping all the giveaways straight! Please include me in this one Nancy. Thank you so much. Love your trims. Please enter me in your generous giveaway. Thanks! Hello Nancy, I would love to be included in your drawing. I've been busy doing some finishing so trims would be most appreciated. :) Melody. Please add my name to your drawing. I'm a bit of a procrastinator when it comes to finishing, but I'm sure that would change if I was a winner! Thanks for your generosity. hand dyed buttons? How neat!! Thanks for the fun give aways!! Please count me in this giveaway again. It dependes on the stitching how I finish . So I like all things for finishing. An other wonderful giveaway of yours? Here I am! I love using trims and buttons, thank you for a lovely giveaway. Oh I love to use trim...and I would love the chance to win some from you. Did I mention that I collect buttons...have been for many years. I sometimes won't use them, just like to look at them. Thank you for all your wonderful giveaways. Another great giveaway! Please include my name. Please enter me Nancy in your wonderful giveaway. I have purchased trims etc from you and they are wonderful. Please throw my name in for this great giveaway! Thanks Nancy! Buttons and trims are always so much fun. Hmm - might be a duplicate - if so, please accept my apologies. I think your trims are beautiful and would like to enter this giveaway. Hope you have a lovely Christmas season - you are certainly in the Spirit! I would love to be included in this giveaway too! I love all of your pretty trims!!! Your trims and buttons are as nice as your floss! Pleasse enter me in your drawing. Thank you so much for your generosity. This is so much fun....I can imagine how busy everything is for you. Please enter me and don't worry about checking my blog - I don't think have had time to post since the summer lol! I post on my blog this morning. Please enter me. Have a great day and thank you! Would love some of your lovely trims to finish my work! Posting on my blog now. I have some of your chenille trims and I love them! Please enter me in the drawing and thank you so much Santa Nancy! I'm just getting into trims and ric rack so this would be cool! :D please enter me for the giveaway! Please count me in Nancy. I am trying to get to finishing my own stitcheries and would love to have some trims to do so. Thanks again for the chance. I love embellishment's especially ric rac. Your embellishment's are always gorgeous. Please include me in this giveaway. Thank you for the chance to enter. I love trims. Wish I could find a magical one that trims off the pounds! Happy Holidays! I love trims and I am also posting on my blog. Thanks for entering me. Ho Ho Ho to you Santa Nancy! Please count me in. Many thanks. I love unusual buttons. Trims are always put to good use too. Please enter me in the drawing, thank you. Oh my goodness Nancy, you had me at ric-rac! I can never get enough of the stuff. In fact I've purchased yours & love, love, love it! Thanks so much for a chance at the give-away. Looks like I'm commenter #63. My chances aren't that good, but it's still fun! Another great giveaway Nancy. Thank you so much. Ric-rac or buttons--going to be a hard decision! As always, so generous. Please include me. Trim pretties! I love them; they are the icing on the cake. Please enter me. Santa Nancy is going to be like jolly old St. Nick and be out like a light on Dec. 26th. Thanks for all the fun. I would love to be included please, I just love your trims! I am already a follower. Which girl isn't fond of trims and ricrac ... I do !! Love your trims and buttons, sure would love to win some ha ha! Thank you for this wonderful giveaway! Love your trims - and everything else - and the draw is on my Birthday so please enter me in the giveaway. I have my fingers crossed which does make wrapping the gifts a little difficult. Wow, there sure had been a ton of Christmas fun around here. Please include me! I am a follower and I am excited about the give away. Love your trims and buttons. Oh this is a ton of fun... Please add my name to this one!!! I love finish work and would love to try these. Thank you! I love that your business keeps you so busy! It's nice to know that a needleart business is thriving. I'd love a chance to win some of your gorgeous trim! I do my own finishing and love your hand dyed trims. I would love to be entered. I would love another chance to win one of your drawings. All I have to say is that my list for your ebay shoppe is getting bigger and bigger. Every time I go to check things out I find something "new" that I love. I would love to win some pretty buttons. I would love a chance. Thanks for all the great giveaways. Where do you keep your reindeer anyway :-) I love your trims and will surely find something to finish! Please enter me. Thank you. I love to do the finishing - so fun to pick materials, trim, buttons, etc. I would love to win this drawing. Please enter me. Thanks. Hi Nancy - I'd love to win some trims, buttons, etc. - I do my own finishing and do some for others, so they would be handy! Will look forward to the drawing! I do love your trims Nancy, especially the chenille. Please pick me! Love using your trims for my finishing - they always make the final pieces so beautiful! Merry Christmas and thank you for these lovely give-aways! hope to win please enter me and make my day! I love trims and buttons! I'm getting ready to decorate some applique kitchen towels I made for Christmas gifts with some fun trims. I like to keep lots on hand, so many uses for them! I would love to be part of your Give-Away. It must be wonderful to feel like Father Christmas around this time of year!!!! Is your house as beautiful as ever? I will post your Give-Away on my blog in my next post. I'd love to win some trims! Of course you have no time to visit blogs. You are so busy. Santa has a godd helper in you. Fabulous prize!! Thanks for the chance! Please add me to this giveaway. I would like to improve my finishing skills, and I'm sure your trims would help! I would love some cluny ricrac! I'm in! I just tried your chenille and love it. One can always use some trims to add that 'extra' little bit to make a project special. Thanks for the chance to win. A very merry Christmas to you too, would love to be included in the draw. I love using chenille trim - especially for ornaments! Would love a chance. Thanks so much! I've seen your trims on other blogs and would love a chance to win some... I do all my own finishing and am a "smalls addict." Just posted your giveaway on my blog's sidebar, too! Trims are one of the best ways to enhance any piece of handmade items...thanks for the giveaway...how thoughtful of you. Visiting blogs can be very interesting and at the same time so time consuming so maybe you do the right thing not to visit any!Great giveaway again! I am only adding this on my side bar, which is filled with all your giveaways!AriadnefromGreece! I so love your chenille trims and all your bits and bobs too! Please include me in your giveaway. I would love to win some of your trims. What a lovely giveaway! I love buttons! You are a very generous person, Nancy. Thanks again. P>S> I posted on the sidebar of my blog. love the look of the trims.. thank you again for the chance! This will certainly make finishing more fun. Thank you! I would love to enter for hand-dyed buttons or charms, thanks! I do finish my own stuff, and I have enjoyed using YOUR chenille trims! And rick rack! Gotta try some buttons next! Please enter me in the drawing! Please enter me. I follow and have your blog on my sidebar. I love using your trims for accent on my finished pieces of needlework. I would love to try Cluncy Rick Rack. Sounds wonderful. Thanks for including me. Would love a change to win some of your charms or buttons. Please count me in. I'm a follower. I've posted all your Giveaways on the sidebar of my blog. Thank you. Tou are SO generous! Please enter me in to your amazing draw! Charms are so much fun to use, would love to win some. Thanks for all the great giveaways. Please enter my name. Love the charms!!! Please enter me in your wonderful giveaway! Thank you! I like to use trims and buttons etc in my stitch sampling a la Sharon Boggon's Take a Stitch Tuesday. And in crazy quilting. So any of these goodies would be most welcome. Good luck on the slowing down! I love use trims and embellishments on my stitching. I'm a follower of your blog. We have a $50 gift certificate winner today!! We have a fabric winner today! A Gift for you and a friend! $25 Gift Certificate winner today! Lots of trim winners today! We have floss winners today! Lots of give-away winners today! Eleventh Day of Christmas Give-away.....Fabric! Tenth Day of Christmas Give-away! Seventh Day of Christmas pick your present! The Third Day of Christmas Give-away! FLOSS!!!!!! Second Day of Christmas give-away!